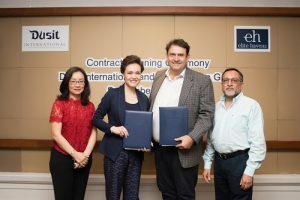 Bangkok (Thailand) – September 11, 2018 (travelindex.com) – Dusit Thani Public Company Limited (DTC), one of Thailand’s foremost hotel and property development companies, has expanded into the high-end vacation rental market through the full acquisition of Elite Havens, the leading provider of high-end vacation rentals in Asia. DTC made the acquisition through its wholly owned Hong Kong-incorporated subsidiary, Dusit Overseas Company Limited, which has bought all shares in LVM Holdings Pte Ltd. (LVMH), a Singapore-incorporated company and the ultimate holding company of Elite Havens, for approximately USD 15,000,000 (THB 495,000,000). Established in 1998, LVMH directly and indirectly holds shares in nine companies in Southeast Asian countries. The largest company of its kind in Asia, it performs integrated marketing, reservations, concierge and management services for luxury villas and currently maintains a network of more than 200 fully staffed properties across Indonesia, Thailand, Sri Lanka, and the Maldives. DTC’s acquisition of Elite Havens follows the company’s three-pronged strategy for sustainable and profitable growth, which includes balance, diversification, and expansion, particularly into new market segments, which will enhance DTC’s capacity to provide integrated services and drive revenue growth. “Our investment in Elite Havens marks another important milestone in our strategic journey, particularly our two-pronged plan for expansion, which includes doubling our number of hotels in operation, and providing broadened experiences for our customers.” said Ms Suphajee Suthumpun, Group CEO, DTC. “Our current brand line up covers the midscale through to luxury hotel segments. Now, with the addition of Elite Havens, we are delighted to cover the luxury villa rental segment too. Following its strategy for balance, diversification and expansion, DTC has been actively enhancing its operations with investments in new market segments. The company made moves into the shared economy last year with an investment in Favstay, a Thai hospitality startup offering condos and villas for rent in Thailand’s top destinations, and in April this year DTC announced it would also enter the affordable lifestyle segment with the launch of ASAI Hotels. A distinctive new brand designed to link curious, millennial-minded travellers with authentic local experiences in vibrant cities and resort destinations worldwide, ASAI Hotels now has five properties in the pipeline across Thailand, Myanmar and the Philippines. Dusit International was founded in 1948 by Honorary Chairperson Thanpuying Chanut Piyaoui, whose ﬁrst hotel was the Princess on Bangkok’s Charoenkrung Road. Today the company is a leader in hotel management and hospitality education and comprises a unique international portfolio of distinctive hotels and resorts operating under four brands: Dusit Thani, dusitD2, Dusit Princess and Dusit Devarana. ASAI Hotels, an affordable lifestyle brand aimed at millennial-minded travellers, is set to open its first property early next year. Dusit International currently operates 27 properties worldwide and has over 50 confirmed projects in the pipeline in key destinations such as Bahrain, Bangladesh, Bhutan, China, Indonesia, Kenya, Myanmar, Oman, Philippines, Qatar, Saudi Arabia, Singapore, Thailand, UAE, and Vietnam. Elite Havens was established in 1998 and features a hand-selected and personally inspected portfolio of more than 200 fully staffed luxury villas in Bali, Lombok, Phuket, Koh Samui, Sri Lanka and the Maldives. The Group manages and exclusively markets the largest curated portfolio of luxury villas in Asia. Elite Havens villa management assumes the responsibility for every aspect of a villa’s logistical and commercial operations, ensuring that exacting standards are maintained and equal to that of a five star hotel. Villa owners and guests are both equally assured of an unsurpassed professional service at any of the villas under Elite Havens’ management.